America votes,"I voted," the Democratic presidential candidate said, holding up the validation slip he was given after turning in a ballot at the Shoesmith School in his Chicago neighborhood. Obama, who could become the nation's first black president, voted with his two young daughters in Chicago before he plunged into a final round of campaigning in Indiana. Sens. 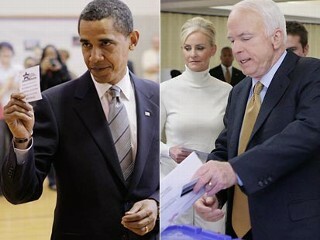 John McCain and Barack Obama kept campaigning right through Election Day. Across the country voters are turning out in what could be historic numbers, in some cases spending hours in serpentine lines waiting for a chance to vote. In an indication of how intensely fought this campaign has been, both candidates kept holding large rallies and television interviews even as voters swarmed to their polling sites. In the past, presidential candidates have halted their campaigns on Election Day. Lines at polling stations around the country indicate the election could result in record turnout numbers. "The election is historic by any standard. Barack Obama might become the first African-American president. Sarah Palin, could potentially be the first female vice president," said Matthew Dowd, an ABC News political consultant. "We're seeing a great generational shift." By almost every quantifiable measure -- from the $640 million Obama raised in the month of October, to the nearly $1 billion combined the campaigns have spent, to 9 million newly registered voters -- records have been shattered. Obama retained an overall lead in the most recent ABC News/Washington Post poll, 54 percent to 43 percent, among likely voters interviewed Wednesday through Saturday. Obama did more than just tap into growing feelings of resentment. He offered a candidacy centered around hope and optimism, and, in perhaps the greatest and most calculated flip-flop of his campaign, forwent public financing allowing him to raise hundreds of millions of dollars from donors contributing small amounts of money.